Restore a healthy glow to skin with the Ecooking Cleansing Gel, a gentle yet powerful formula ideal for normal to oily skin types. Infused with soothing Cucumber and Aloe Vera, the cleanser expertly melts away dirt and impurities whilst replenishing deep moisture to maintain a healthy skin balance. Antioxidant Vitamin E helps to neutralise free radical damage to fight against premature ageing and create a smooth, bright and revitalised complexion. Apply the cleansing gel to the palms of your hands and massage the product thoroughly into the face, neck and décolleté. Rinse with running water. Afterwards, use Ecooking Facial Mist in order to add extra moisture to the skin. 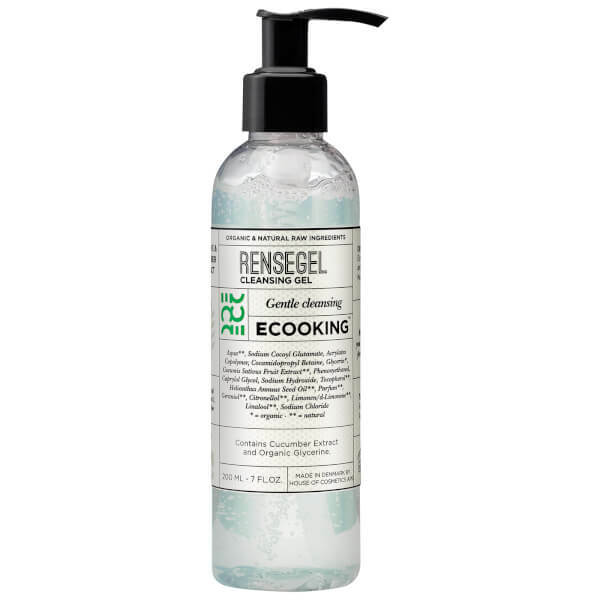 We then recommend that you apply your favourite serum and facial cream from Ecooking. Aqua**, Sodium Cocoyl Glutamate, Acrylates Copolymer, Cocamidopropyl Betaine, Glycerin*, Cucumis Sativus Fruit Extract**, Phenoxyethanol, Caprylol Glycol, Sodium Hydroxide, Tocopherol**, Helianthus Annuus Seed Oil**, Parfum**, Geraniol**, Citronellol**, Limonen/d-Limonene**, Linalool**, Sodium Chloride.